Join Our Team! Our Home is accepting applications for a Part-time Fiscal Manager – Deadline to apply is October 15th. We are seeking an individual with proficiency in accounting practices and payroll, office management, and computer applications QuickBooks, Excel, and Word. A successful candidate will have good communication skills, will be a self-starter, and will be able to work well with the agency’s director and with the coordinators of Our Home’s programs. Our Home is a private non-profit organization with a number of programs that provide assistance to people with various types of needs, including services for victims of domestic violence, emergency financial assistance for income eligible individuals, and supervised visitation services. The organization receives grant funding with specific record-keeping and reporting requirements; Our Home also partners with churches and other local organizations and individuals who support the agency with donations. The position will average 15-20 hours per week and is ideal for a qualified person who is particularly seeking part-time employment. To Apply: Send a cover letter with your resume to kmescher@ourhomefrc.com by October 15, 2018. In the cover letter, explain your interest in the position and your qualifications. Experience/Certification Required: Minimum associate degree in accounting or related field with knowledge of computer applications QuickBooks, Excel, and Word. Work experience in accounting and secretarial practice required; experience with federal grants preferred. Qualifications: Background check required before hire; confidentiality agreement. Salary/Benefits: Competitive wages and benefits, including holiday pay, vacation pay, sick leave. 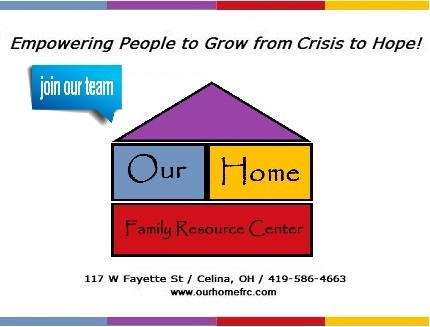 Notes: Our Home Family Resource Center is an Equal Employment Opportunity employer.